I am pretty overwhelmed over at Chez Us, in fact, we are lucky to even have a meal on the table! We are unsure of Easter plans, so we decided to devour a ham this past weekend. Okay, it has not been completely devoured but close. 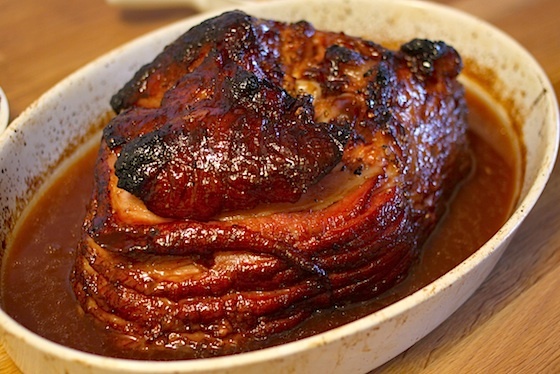 Pomegranate and Rye Whiskey Glaze will help make that Easter ham even more special! Let me start off by saying we both dislike a ham that has pineapple, cherries and cloves punched all over it. Sure it kind of looks like it belongs on a Cruise Caribbean brochure but some things, such as pork, should not be covered with the such. As well, let me tell you a little secret, this is only the 2nd or maybe 3rd ham I have ever cooked. I had really hoped to be able to get a ham that could be slow cooked for hours but the market was out of them. Instead, I picked up this spiral cut ham, glazed it, and put it into the oven, just until the skin was crispy and it was heated through. I was amazed at how juicy it was. Oh, and the glaze was really fantastic – slightly bitter, not too sweet (remember, we hate sweet hams) and a little peppery …. it could have been a cocktail! Perfect for your Easter table. Put the pomegranate juice and brown sugar into a saucepan. Lower heat to a simmer. Add the rye, stir and continue to simmer until reduced to half and slightly syrupy. Baste ham with glaze during the cooking process. 8 Responses to "Pomegranate and Rye Whiskey Glaze"
Hmmm... Neil is in charge of the ham glazing this year and I think he has already picked his recipe but I LOVE this. Bookmarked for the future! That looks too good most especially with the pomegranate juice glaze. Yummy, that looks so good! Gotta try that. Thank you! I made it for Easter and everyone loved it. I am making it again tomorrow for an ordination.